Hi gang, this page is as much for me as it is for you. As many of you might be aware, when one has mulltiple cyber presences where folks can locate you or see your various galleries, personas or works, all of the information is rather difficult to present neatly on a little business card. And certainly I don’t want to hand out these big old honkin things that are awkward, don’t fit anywhere and always need changing because a new URL, shop, blog or whatever has popped up. You know – picture the kind Fred Flintstone carries around. That said, I have decided to create a page, ONE page, that I will put on my business card. It is the only place that will be the gateway to where you can find me or my stuff. Many of the links are to galleries where I display my art for sale. Some are just places I hang out, like my blog. Others might include my growing set of online shops (Zazzle, Cafe Press, etc. for items beyond prints) Or a link to my publisher where, of course, you can easily find my book. This will take some time to build (methinks it may never be complete), but it is the most current and comprehensive set of links to me anywhere of the web. So I’ll just call it my BIG business card. 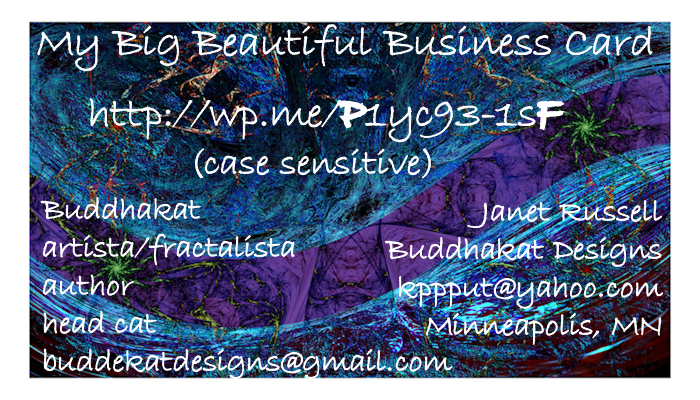 If you have gotten here from one of my new single link business card, then my goal has succeeded. The only link on mu actual card is http://wp.me/P1yc93-1sF , the link to this page… I hope this works as good as it sounds on paper! Check it out! Everything of mine on Zazzle is priced so low you won”t believe it! Sale lasts at least through the end of the year (2013)! My Grand Opening sale at my y Cafe Press Buddhakatdesigns shop – all prices are so low, you’ll have to pick them off the ground! These prices/sale runs through the end of 2013, at least! LOTS of brand new products many of which are available exclusively at my new Cafe Press Shop.